The intervention by the restorers allowing the original part of the stone work to show up. A part of rampart at Fort Ricasoli, measuring 100 metres in length and about 13 metres high, has been restored by the Ministry of Resources and Infrastructure's restoration unit. The restoration cost about Lm110,000 - or some Lm1,000 per one metre height of wall, Hermann Bonnici, the architect in charge of the project, said in an interview. 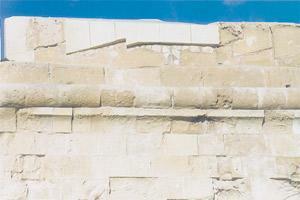 No sand blasting, grit blasting or power washing - which harm the stone - was used. The task, undertaken by a private contractor, took 14 months to complete. In Grand Harbour there are roughly 25 kilometres of bastion walls and the cost of restoring them temporarily would work out at some Lm25 million. "It is difficult to estimate how much the restoration of the whole fort would cost because the building is facing various problems. For one thing, one would have to devise a means of shoring up against rough seas," Mr Bonnici said. Stephen Spiteri, superintendent of fortifications who also served as a consultant, said this was more of an emergency intervention than a restoration project. "The bastion had been declared a dangerous structure because it had quite substantial damage. Fort Ricasoli is in extremely bad shape because it has been consumed by the elements. The problems at Ricasoli are huge but the fort has enabled us to understand what the rest of the operation would involve. "This has been a case study of what it would take to properly restore such bastions. No such study has been carried out before," Mr Spiteri said. Mr Bonnici added that there was a natural fault in the lay of the land that has allowed the sea to eat into the rock under the fort. The restoration of the whole of Fort Ricasoli would need the contribution of various stakeholders including the government, the private sector and the Malta Environment and Planning Authority. "We are talking of millions of liri," Mr Bonnici said. Fort Ricasoli formed part of Grand Master Nicholas Cottoner's master plan designed by the Italian engineer Antonio Maurizio Valeperga at the end of the 1600s for the defence of Valletta against both landward attack and bombardment from the sea. The fort together with Fort St Elmo at the lower end of Valletta and Fort Tignè guarding the entrance of Marsamxett Harbour played a unique role in the defence of Valletta. Fort Ricasoli's role remained valid during the occupation of Malta by the British until World War II in the early 1940s. This is still evident from the structural additions and gun placements on the seaward side of the fort. Although this was not the case with Ricasoli, the casemates in the bastions in urban areas such as the Cottonera Lines, Santa Margerita and Floriana were used for social housing. During the reign of the Knights of St John there were various requests from people to be provided with social housing. "Every internal space was given out to poor families. For example, the Cottonera Lines used to house about 400 families. One can imagine what kind of facilities these families enjoyed. There was a clause in their contract saying that, in case of war, they would be evacuated without any form of compensation," Mr Spiteri said. Apart from the elements, Ricasoli has suffered from the ravages of WWII. The gate has been re-built but not the Governor's House, which used to house the armoury and the captain's quarters. International film companies currently use the piazza. Mr Bonnici said the British had carried out an extensive intervention on the walls of the fort by removing between 15cm to 20cm of the outer layer and cladding it with a fresh layer of franka. With the passage of time, however, this layer became detached from the wall and collapsed. "We had two options: One was to remove the part added by the British, which would have involved departing from reality and exposing the bastion as built by the knights. The second option, the one that was decided on, was to carefully remove and number individually the franka slabs and hold them in place with the same type of aggregate as used originally," Mr Bonnici said. Every slab was returned to its original place. Stainless steel ties designed purposely for this type of restoration were used to hold the slabs more securely to the bastion. The stonework that remained, dating back to the time of the Knights of St John, was treated to eliminate the salt content in the first layers of the stone and consolidate it to restrain the erosion.